And All That Carry On…. – Page 2 – Reimagining life in my 50's. I found my way to the sea again. In the shank of July, New England weather generally sheds its predictable, unpredictability and settles into heat and humidity in-land and glorious beach weather at the shore. Go figure… on my week of vacation, the sea is angry and the skies? Well…dark and stormy. The air temperature is groaning to reach the low 60’s and the wind is making a mess of my perpetually chaotic head of hair. This summer, each weekend since late June, save the 4th of July, I have competed to bring New England tennis championship glory home for Connecticut, only to fall short again and again. First at mixed doubles, then women’s 55 and older. In sweltering hangars masquerading as indoor tennis centers, I battled ego, fatigue, and opponents who were equally invested in maneuvering a fuzzy yellow ball out of reach of racquet. As I played, sweat poured from my scalp, forehead, armpits, and made a river in my cleavage. Vacation week on Block Island was a distant mirage. In the final day of constant competition, the anterior tibialis of my left calf began its’ weep. The tennis elbow which had kept me off the court for a month prior started to growl again. By the final day, my right forearm sent angry messages to lay my racquet down for a time. Even in loss and pain, what fun it was! Weeks of competition came to a disappointing close and I meandered to New London on a sunny Sunday, hopped the express ferry and in 75 minutes popped on my sunglasses and lugged my bags onto the docks of New Shoreham, Rhode Island. Tennis will be there when I return. I would not need my sunglasses again for days. My dear friend and regular traveling companion, Jo Ann, met me as I disembarked. In a jiffy we were picked up by our hostess in her runaround, Island-ready Subaru. In a leap of faith, Jo and I had accepted the gracious offer to stay in her friends home; rent a room in a house with a view of the ocean. 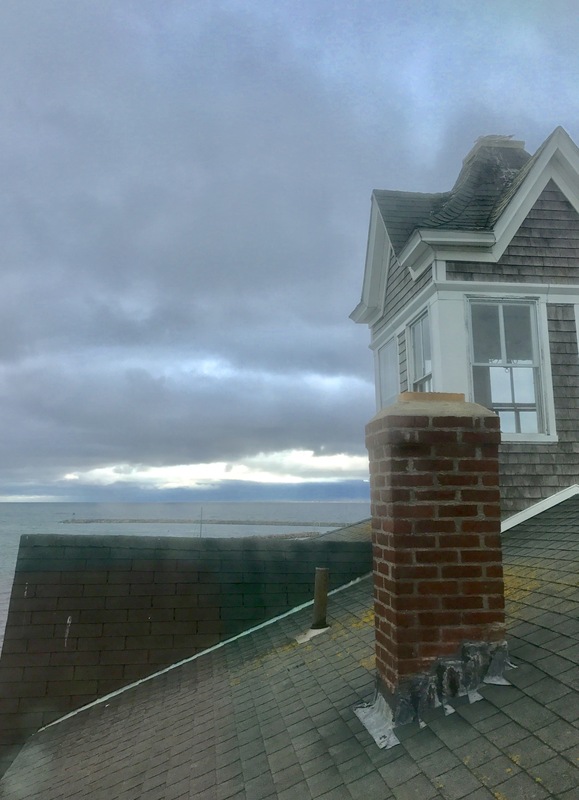 I was happy to be ashore and thrilled to see the grey, clapboard shingled home of our hostess, as laughter wafted through the screen doors and onto the front porch overlooking the increasingly churning Atlantic Ocean. Bottles of wine and beer in icy coolers were there for the taking. As I entered the house the savory scent of ham and scalloped potatoes escaped the oven, tempting my behemoth appetite. Friendly faces of other ladies staying there welcomed me. Vacation looked promising and, as woman so easily do, we came to know each other’s stories long before sleep beckoned us. Last year, I rented off-season in Watch Hill and lucked upon Indian Summer. Temperatures hovered in the 80’s, the beach sand was warm, as was the salt water in which I swam each day. To vacation in similar style would be out of my price range in the heart of summer. A shared house with a view of the ocean in Mid July? It gave me pause, but I thought it was worth a try. As I climbed the charming wooden staircase and turned into our room tucked in the corner of the ancient home, I was reminded of my initial skepticism. I had to duck my head to avoid the short door frame and pessimism took hold. Our room was charming for one; teensy for two. Jo arrived a day ahead of me and claimed the single bed by the window, as agreed beforehand. I was game for the air mattress on the floor. We each took a drawer and ½ . The air mattress stood on its end, leaning against the wall, and once we wrestled a twin sheet on it and laid it on the floor, it was obvious that an evening trip to the bathroom would be treacherous. Surely, I was weary enough to settle into a cocoon on air and give in to the lullaby of pounding ocean surf. My 55 year old body protested. At 5’8 inches, the 6’ twin air mattress did not allow for the splay I enjoy in my king size bed; hands and feet met wooden floor throughout the night. A roll to the left or right meant floor met body. The ear plugs Jo provided to muffle her dulcet, evening tones were of little practical use; they popped from my slender canals. No amount of focus could set me to dream and so I grabbed my blanket and pillow and gingerly maneuvered the floor space to escape to the downstairs couch around 2 a.m. I adjusted myself in the roomier space, and closed my eyes, only to tune into another symphony of snoring in the downstairs bedroom. Sometimes, sleep is but a dream. As the rest of the house rose, so did I. I was agitated, tired, and wholly out of my comfort zone. I poured a cup of coffee and looked out at the still angry sea and wondered why I ever thought a shared room and air mattress would work? Then I checked my email. As happens sometimes, there was one that cleared my head and directed me to make a grown up decision. Someone died. Not someone I knew, but the best friend of a writing companion I’ve come to know well. Robert’s best friend since high school passed away unexpectedly. His age: 59. Robert had recently shared dinner with him with the expectation of many more dinners to come. The inexplicable shock of death shook me from my martyred, sleep-deprived space. The first thing I did was find my own room with a view. The old me would have fought the tide; complained of discomfort but hunkered back down on that mattress resolved to make it work. The old me would have slapped a smile on it, but seethed underneath. As the week wore on I would be no one’s pleasant companion. Someone died and I phoned a hotel and found a room with a view. Someone died too young and I put worry of money aside and packed my luggage, thanked my hostess, and checked into my own room with a view. Perhaps, I seemed like the Princess and the Pea. But here’s a new twist: I don’t care. I understand at 55 that mortality lurks around every corner. People die unexpectedly and the money left behind has no real meaning. So someone else can take the mattress and share space with strangers. Not me, not anymore. People die unexpectedly. I hope you don’t mind, but I’ll take the room with a view. I seek to understand. I try to make a rational argument, but responses are irrational and facts are muddled and dressed up as truth. So, I walk away. The fact that I was a participant in the Women’s March, an eyewitness to history, seems to mean little to those determined to diminish it. Apparently, those who had the audacity to walk are extremist, anarchists, and, naturally, angry. Those positioned to pounce and pick from the comfort of their home appear to have the inside scoop. Peaceful demonstrations reimagined: Anarchy! Fox News told them so! That wasn’t my experience on a sun-drenched Saturday in Key West, Florida, as I walked with three thousand plus along Duval Street, chanting, singing, smiling, hugging and admiring. I walked alongside a red trolley, seated within were extraordinary men and women, most on the north side of 80, whose aging bodies made the walk impossible. They carried signs, and some wore silly hats. They all looked alive, purposeful, and grateful that they found this moment, late in their life, to exercise the rights the Founding Fathers gave them: peaceful protest. It was a meaningful moment in time which they thought might never be realized as their lives look to the twilight. I spoke with an African American woman grinning from ear-to-ear with her best friend. Her tee-shirt said, “I Am My Ancestor’s Wildest Dreams.” My God, that’s a sobering, wonderful thought, isn’t it? It was not lost on that beautiful lady that this great country, in the Bill of Rights and Amendment’s to the Constitution, gave her the right to this day, to walk peaceably with her sisters and brothers along a palm-shaded street on the Southeastern most tip of the United States of America. Young women, many with their husbands beside them, marched pushing strollers. Most of the children were girls, the daughters for whom they dream big dreams; that the world will not threaten to dismiss them because of their gender. Maybe, just maybe, those baby girls will grow up in a world where this conversation is spoken in a nod to history. How I wish my own girl had been with me. She wasn’t. Rather, she was wielding a lacrosse stick in an indoor pre-season league preparing for her senior season. Title IX at work. In Key West, Los Angeles, Washington, Paris, Stockholm, San Francisco and throughout this great world, women gathered and welcomed the support of men in The March. I had friends marching in Washington, New York, Hartford, Phoenix, and Omaha. All of them reported joy, empowerment, and an appreciation that we live in a country where such a thing remains an inalienable right. Key West is an interesting place. This is the first time I have been to the Keys, and as I write, in the near distance, I see white caps dancing on water whose shades of blue seem to change with each gust of wind. My view of that vast Atlantic is disturbed only by majestic palm trees and thatched palapas where weary northerners lounge, desperate to re-energize on a late January day. Key West belongs to Ernest Hemingway. If there ever was a man’s man, it would be Hemingway. He was a big game hunting, deep-sea fishing, safari-loving, bombastic man with the soul of a poet. It took me years to appreciate his writer’s voice. He had none of the grandiosity of my favorites: Fitzgerald, Austen, and the brilliant Oscar Wilde. My literary palette has matured with age, and I now find Hemingway’s direct, simple, potent narrative powerful. For all his surface bravado, Hemingway had a fascinating perspective on women. Despite his traditionalist view of them, his women were strong, complex, and clearly important in his personal and literary life. As I marched in Key West, I imagined Ernest sitting on a Duval Street Veranda, in a rocking chair, cigar in one hand, and a potent Bloody Mary in the other, fascinated by the scene that played out in front of him. I imagined Ernest Hemingway, with a nod and great guffaw, shouting out, “Have at it, ladies!” I think Hemingway wasn’t intimidated by women, as much as he was bewitched and besotted by them. Perhaps the most off-putting accusation about the March was about violence and broken glass at a Starbucks in Washington DC. Please don’t muddle the facts. That despicable act happened Friday during an Anti-trump incident that was not part of the Women’s March. Would I have preferred that Ashley Judd control her rhetoric? Sure. Do I wish the same thing of Madonna? Yup. But what about the magnificent Gloria Steinem, Scarlett Johansson, America Ferrera, and Michael Moore, who reminded all of us to stay involved in the process, be doers, be dreamers. What about all the organizers throughout the world who have no celebrity cache, but pulled off one of the greatest, most unexpected, most peaceful mass Marches in history. I’m proud I was part of it. Those who stayed home? Maybe save your rhetoric for the things you show up for? To my friends who share my perspective, here’s a thought that might surprise you. I wish, for the love of Pete, that those who supported the March might tone down the oratory and banish base language from their social media. Rise above it, use your intellect to state your case. Don’t take the bait. We have a responsibility to elevate the conversation with thoughtful, factual discourse. I believe our better angels possess a better vocabulary. Mr. President, when you walk the walk of Washington, Lincoln, Roosevelt, Truman, Eisenhower, Reagan, Bush, Sr. and Obama, maybe you could give some thought to the gravitas of the Office of the President of the United States of America. Is it too much to ask that you button your suit jacket? A little respect, that’s all we are asking for. Somewhere along the journey, it became very complicated. The other day a friend shared something she had read, “In your lifetime, the average person gets 10 really good Christmases.” Isn’t that astounding? How is it even factored? How does one research or gauge what qualifies as a really good Christmas? To be sure the Christmases of my childhood are really good in memory. The buildup, the lists, the baking, cousins, grandparents, aunts and uncles, and the soft glow of a candle in the window of your bedroom as you fell asleep each Advent night. My mom loved to tell the tale of one of my earliest Christmas lists for Santa. She was befuddled by the very first item: A Layaway Doll. She called her friends, mothers of other girls my age, wondering if they knew of this doll. They knew of Barbie and Chatty Cathy, and Teensy Tears, but hadn’t seen an advertisement for a Layaway Doll. My mom was a Christmas pleaser – gift giving with precision was her thing – and she certainly wouldn’t ask me for clarification on the off-chance it would prod any suspicion of Santa Claus. That Christmas morning my Layaway Doll was under the tree. She was 3 feet tall, and loose-limbed, with blonde hair, and wore a pink smocked baby doll dress. I named her Ella and loved her with all my heart. An adopted child, adopting a doll one needed to wait for, to have patience for, who needed to be loved. Isn’t that something? The best Christmases of my life, post-childhood, are easy to pinpoint. Being in love at Christmas is wonderful and I have been fortunate in my life to have that more than once, and hold hope that I will again, someday. The best Christmases, however, are seen through the magic of your own children’s eyes, when they still believe in Santa Claus and are enraptured with the story of the Baby Jesus. Those Christmas mornings when you have to wake at dawn because the excitement cannot be contained. After all the chaos of gift opening is over, and beautiful Christmas outfits are donned, you take your place in a pew and kneel to remember that all the hub-bub is really about one beautiful child born in a manger centuries ago. I wish I had known then how short-lived that experience would be. The day before Christmas this year, my ambivalence had settled in. I was feeling harried, crabby, and a little off my game. I met three friends for lunch at a lovely restaurant. I’m not sure my heart was in it, but we ate and caught up and soon after the final morsel was eaten, I felt the tap on my shoulder to move along. I had things to do, they had things to do and I was of a mind to just get on with things and maybe, just maybe, December 26th would hasten forth and this mildly disappointing Christmas season could be tucked away. We paid the bill, gathered our things and I looked out the window and, honest to God, saw a stream of Santa Clauses entering the restaurant. One after the other, in various states of costume, they came. I did a double take to be sure my imagination had not swept me away. “You guys, check out the Santa’s!” I directed my friends’ attention to the window. My friends and I gathered outside and found ourselves quickly enveloped in a sea of red and white on a beautiful Friday afternoon. I was unexpectedly alone this Christmas Eve. Plans were made and then foiled. A year ago, that would have undone me. Tonight, I sat on my deck and drank a beer with my loyal Labrador beside me, and toasted to those Santa’s. It appears they came to me in the nick of time. Fifteen perspective adjusting Santa Clauses feels a bit like the work of the Holy Spirit. My mother passed away 11 years ago on Thanksgiving night. I struggle to remember the exact date of her death. The anniversary of it is inextricably attached to Thanksgiving. She was diagnosed with Adrenal Cortical Cancer in late September. The following nine weeks are a confabulation of disturbed memory and racing recollections of traveling to and from Rhode Island. Weekends were spent with my dying mother and distraught father, and weekdays trying to refocus on my family. My children were so young that my daughter has little memory of a grandmother who loved her in a special way. She was the only granddaughter in the mix of boys. Grace was 6 years old on Thanksgiving night 2005. When I cleaned my mom’s closet out weeks after her death, I found a stockpile of beautiful, expensive dresses, sweaters, and coats that would see Grace through several years of special occasions. A corner of the closet was filled with precious items which surely cost too much. My daughter was something of a life-size doll for both my mom and me. Grace knew indulgence in fashion from the moment she was born. There was one such card that affected me more than any other. I thought I had saved it, but could not find it, as I sifted through special things this week. It doesn’t matter. While the words may be imprecise, the message is indelible. That beautiful letter moved into my soul the moment I read it on a cold, quiet December afternoon. I was 43 when I lost my mom and Betsy’s letter was like a gift. Even in my incalculable grief, I understood that the death of one’s mother is an equalizing human experience. In the natural course of living, parents pass before their children. All of my friends and cousins who still had their mom’s, who sympathized, but could not empathize with the depth of my loss, would someday experience the same. To be sure, I was imbalanced for quite some time when my mother left this earth. In the last two years, I have attended too many funerals, watched too many friends and cousins say goodbye to too many mothers. It feels like time to take a cue from Betsy. My mother’s greatest gift to me was her example of faith. She was an epic church goer, a Catholic from the tips of her toes to the top of her head. I am not any of those things, but there is a moment I call upon when my own struggle is mighty. My mom might say this moment was the work of The Holy Spirit. Despite the fact that I had philosophical issues with the “Big C” Catholic Church, my local parish had been home to me. I was a catechist and you could find my family, 6th row left of center, each Sunday morning at 9 am. I loved the ritual of the Catholic mass. The predictability and familiarity of the liturgy were like meditation for me. Once my mother passed, church became impossible; the smell of incense or a single organ note undid me. I vividly remember that first Christmas Eve, entering the church with my family, finding our pew and, as the congregation settled in, the choir led with “Oh Come, All Ye Faithful.” Grief grabbed me by the throat and I let go of my 6-year-old daughter’s plump, impossibly soft hand and made my way out of the church with as much dignity as I could muster. The cold night air was a welcome relief, and I wept as I walked the parking lot for the hour it took for mass to be over. The strains of “O Little Town of Bethlehem” and my mother’s favorite Christmas Hymn, “O Holy Night”, wafted from the Church into the night air. Each note like a stab into my already broken heart. I knew then, that Church would never be the same for me again. For two months following my mom’s death, night was my demon. I battled through the daylight hours, but once my head hit the pillow, unsummoned tears would leak from my eyes and my mind raced around every detail of the previous months. Exhaustion ushered me to sleep, but dreams of my mother woke me nearly each night. I dreamt, not of my mother as I knew her, but of the diminished her, twisted with the pain of cancer that consumed her body. It was as though I never knew her whole. Her pain was a nightly visitor. The first waking moments for those grieving are predictable. It takes but a moment of consciousness to remember the pain that has been dreamt away in the deepness of sleep. As consciousness nears, the ache rebuilds. I woke most mornings of those two months willing fresh tears away. As the world turned to a new year, a challenge I was not ready for presented itself. My husband’s father had died the previous January. He was a kind, benevolent, smart, wonderful soul. A Mass of Memorium was scheduled on the anniversary of his death. I could not fathom surviving it. I wanted to summon the courage I knew I needed to do the thing I knew was right. I spent the week before oddly “psyching myself up” to gut it out for him, to be an example for my children. The night before, I crawled into bed and prayed that I could be relieved, Dear God, just once, of dreams of my sick mother. I fell asleep that mid-January night, determined to rise to the occasion regardless of which visitors came to me in my sleep. My mother and I walking the boardwalk of Weekapaug’s Fenway Beach, both of us carrying beach chairs in our hands. The sun was high and the sand was soft and my mom looked lovely, in her skirted bathing suit and white cover-up. We set our chairs down, side by side, and the waves were gentle and our toes massaged the sand. That’s all I recall of my dream on that January night, and it is enough. And I did. I went and honored my father-in-law in the way that he deserved. Any tears I shed in the church were for the memory of him. My grief did not end that January night; it remains in my soul. My friend, Betsy, was right. I lost my North Star when my mother passed. I am not so sure, 11 years later, that my navigational ability has improved. I remain a bit unsettled but feel as though I am finding my way. I dedicate this writing to the women in my life whom I love. Many of you have lost your North Stars. Many of you have yet to. In your grief or grief to come, I wish you peace and the surety that the Holy Spirit is present. I have experienced him/her many times since that January night in 2006. Listen for it in your sadness, be open to it in your grief. What a lovely gift for a mother to a daughter. It is as precious as the perfectly smocked dresses my mother bought her grandchild 12 years ago. It is as perfect as a lovely, handwritten note from a friend that would resonate in my heart forever.